The first president of the US, George Washington, had false teeth after the deterioration in his real teeth forced dentists to remove them. 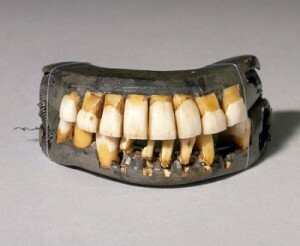 Washington was notoriously picky about his false teeth, and he had nine different dentists attempt to make him dentures that were comfortable enough for him to wear. One dentist succeeded but constructing a set of false teeth out of the teeth from a cow, hippopotamus, and walrus. This same dentist made him four sets of dentures, one of which he is buried with.